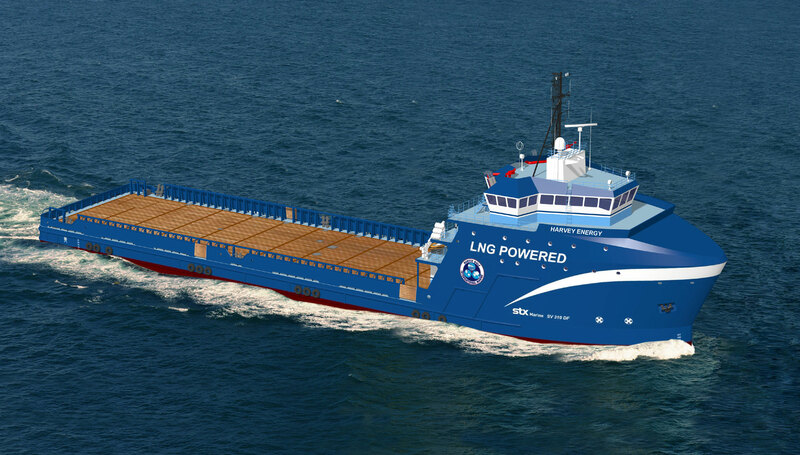 MEITEC has been involved in the historic construction of the first dual fuel offshore service vessel (OSV) in the U.S.
Harvey Gulf International Marine became the first U.S. vessel operator to contract for construction of vessels capable of operating exclusively on natural gas. In addition to being powered by cleaner burning natural gas, the vessels will achieve “ENVIRO+, Green Passport” Certification by the ABS. The requirements for this certification include, among others, that the vessels be continuously manned with a certified Environmental Officer, be completely constructed with certified environmentally friendly materials, and have advanced alarms for fuel tanks and containment systems. Along with Harvey Gulf’s other vessels under construction, they will be the first OSV’s to achieve this certification, making them the most environmental friendly OSV’s in Gulf of Mexico. Harvey Gulf continues its commitment to environmental protection by becoming the first to build U.S.A. flagged vessel that can run entirely on natural gas. These vessels will meet the highest emissions standards that exist today and even higher standards that haven’t been created yet. Harvey Gulf recognizes the strong stance on environmental protection by the administration in the wake of the oil spill and is doing its part to respond to it and provide our customers support for their environmental commitments. MEITEC completed the very successful electrical construction and commissioning of this first vessel, and continues to provide the electrical and instrumentation construction on the series of these vessels being constructed over the next several years. MEITEC is proud to be able to provide it’s unparallel expertise in marine construction to these projects. In addition to exceptionally skilled and experienced technicians and project management, MEITEC brings years of experience in all types of marine construction, including new construction and major system upgrades for a myriad of different vessel types and customers around the world to our customers today. Strong, long term relationships with MEITEC’s customers and employees is the key to providing successful project outcomes for outstanding organizations like Harvey Gulf International and our other marine customers now in the future.